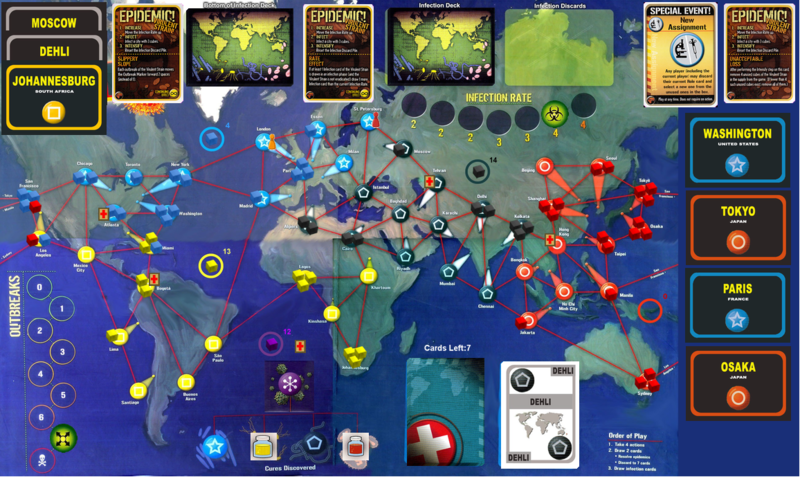 If you're winning Pandemic, you're playing it wrong. Still need a discard or play from JfP. Red Plague is the Virulent Strain. Johannesburg got hit with 3 cubes because of the Epidemic. Red Plague has 0 cubes remaining in its supply! Only 1 thing to stop Johannesburg from outbreaking. Fly to Cairo. Drive to Khartoum. Drive to Johannesburg. Treat Johannesburg. I didn't draw enough cards for last turn's Infector Phase. The rate raised to 4 and reds were drawn, so I should've drawn another card. Moscow should have been the fifth card and received another cube. Not sure what you can do about that. I think the game may be over. Thanks for running it @stever777 - a few mistakes killed us. Oh well. I see I messed this game up by not giving you guys 4 cards to start with. Would you like to have a re-match against the diseases? Huh... holy crap. Didn't even notice. And we could've done it too. @Stever777 I think just host a new game with open invites as usual. I'll come on board regardless.